This summer, I challenged all of you to head outdoors and take on a project or two. 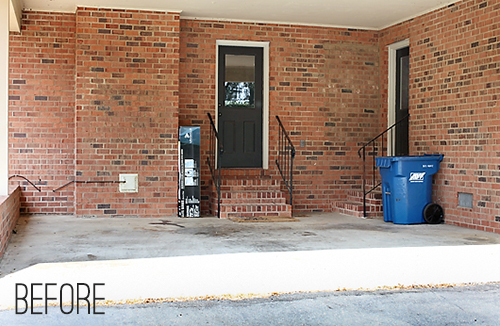 Ashley, from 7th House on the Left, went way above and beyond with her outdoor project. 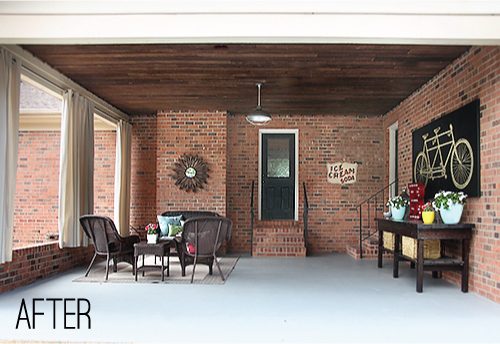 Her carport transformation is stunning and jaw dropping and incredible all at the same time. I was already in love with it, and now she is stopping by to throw some organization into the mix, sigh... Here she is now to share more. For the past few months, Greg and I’ve been working on turning our carport into a covered patio. Since we have adequate driveway space behind our house for parking cars, we rarely parked in the carport simply because we liked the openness and how it gave us a sense of an “outdoor entry”. We gave our existing patio furniture a facelift (with some spray paint and pillows), spruced up a roadside find to use as a large console table, planked the ceiling, painted the floor, replaced the lighting, installed patio lights around the perimeter of the ceiling, installed wall to wall curtains, brought in an area rug to define a seating area and dressed everything up with fun wall art and accessories (you can find a full run down of the projects and their links in this post). There are still a few more things we’d like to do to the space (like get new seating and maybe lengthen the curtains just a tad), but we’re extremely excited to enjoy the area in the Fall once the weather gets a little nicer and bugs aren’t so... “persistent”, haha. 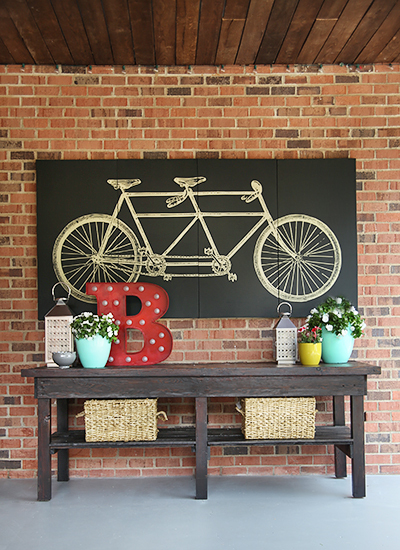 My favorite area of the new covered patio is the wall with our huge console table. We actually found this table on the side of the road for $20 (more on that story here). What we really love about this table is that it’s so versatile. It comes in very handy for working on projects that are too messy for the kitchen counter but can also be used as a buffet table when we’re entertaining outside. 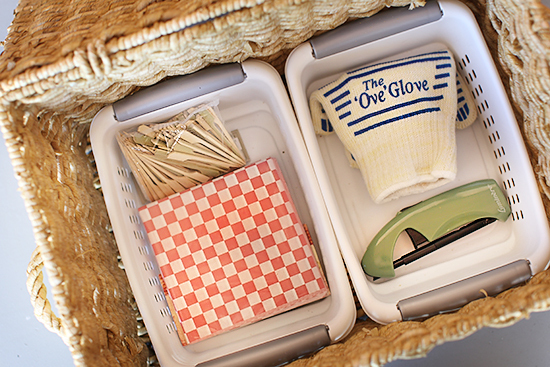 Regardless of how we’re using it, it also serves the purpose of storing some outdoor essentials. To add some extra storage to the console table, I picked up two of these lidded baskets from Michael’s. They were originally $39 a piece, but luckily, Michael’s was having one of their beloved “40% off baskets sale”. Score! I love these baskets in particular because the lids are great for keeping dirt/dust/pollen off of what’s inside. The table could easily house 4 baskets (if I turned them long ways), but I wanted to keep things simple and uncluttered. In my book, the less “stuff” you collect, the better. We decided to use one basket for outdoor grilling essentials and the other for outdoor kids toys/games. No, we don’t have kids, but there’s a method to our madness and I’ll get to that in a bit. In here, we have... an Ove Glove (really handy for grilling skewers/kabobs), the lighter for our charcoal grill, some meat markers (to mark the “doneness” of meat), and some “burger papers” (that actually come in handy for a lot more things than burgers). Greg wants to add a meat thermometer to the basket as soon as he “finds the right one”. Men and their grilling. Now for the outdoor fun basket. Last Fall, we had an afternoon with seven kids under the age of 6 in our house at one time. Not having kids ourselves, we realized we didn’t have any toys, games - not even a ball for them to play with. I had some coloring books (because I’m one of those weird girls in their 20‘s that likes to color once in a while, haha!) but that only kept them occupied for... oh, I don’t know, 2 minutes! I ended up going to Bentley’s stash of new dog toys and giving them to the kids to play with. Yes, that’s how desperate I was. Note again: they were *brand new* dog toys, haha. Giving children used dog toys would totally wreck my inner clean freak. Since then, whenever I see a fun game or puzzle in the Dollar Spot at Target, I buy it and stash it away in a basket in our guest room closet. Now that I’m on my way to having the indoor fun covered, we thought it would be a good idea to have some outdoor fun options as well - after all, most of our friends’/cousins’ kids love playing outside and I remember how bad I felt when I had to tell my freakishly adorable 3-year-old cousin, Elliott, I didn’t have a ball for him to play outside with. Luckily, I was able to stash a bunch of outdoor fun in this basket. In here, we have sidewalk chalk (since we have a large blacktop driveway that wraps around the back of our house that’s the perfect canvas for temporary masterpieces), bubbles (what kid doesn’t have fun with bubbles?! ), a few plastic dinosaurs (outdoors is the best backdrop for dinosaur habitats, duh), a few foam finger rocket launchers (a good idea until the neighbor’s dog gets a hold of one), a Velcro toss and catch game (I had one of these when I was a kid and remember loving it), and, yes, a ball for Elliott! 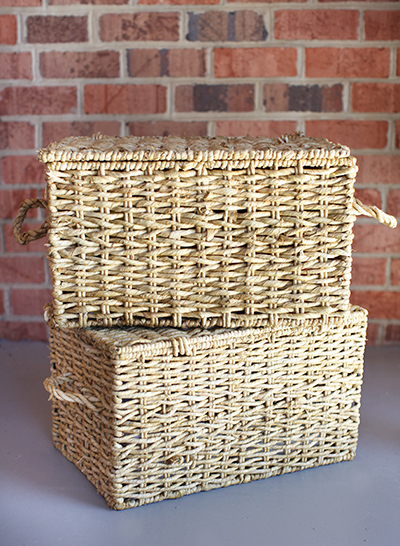 Having these baskets stored in the covered patio is so convenient - especially since Fall is on the horizon and we’ll be spending much more time out there. Thanks, everyone, for letting me share our outdoor patio storage solution with you today. As Jen always closes... Happy Organizing! That is so sweet of you to have games for kids that visit. You are awesome. I have a question about these "outdoor spaces." How does one deal with art, rugs, curtains, etc. that are outdoors and exposed to the elements? I guess there are some climates where this might work, but this person lives in Hanover, VA (a few miles from where I live). We have 4 distinct seasons (althuogh we also have January days at 80 degrees, snow on April 1, and a million other "non-seasonal weather happenings"), two of which dump inches of yellow pollen dust on every surface (and will go right through those baskets). It rained (hard) here more days than it didn't this summer. How is it that those curtains and the rug aren't soggy mildewed messes? Do you run outside everytime the rain starts, and bring everything in? Do you clean all these surfaces daily, to dry them off/get rid of pollen/spiderwebs/dust? I'm truly curious. Yes, if you have an outdoor entertaining area you will need to clean it a bit. You can decide if you want to clean it regularly or clean it before/when you use it. We have a pool, seating around the pool and dining under a gazebo. I will wipe things down when we have company coming, a pool party planned or the weather is perfect for dining alfresco (a too rare occurence here in Dallas, LOL!). 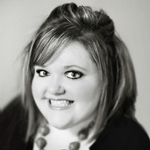 Ashley, I love your carport transformation!! 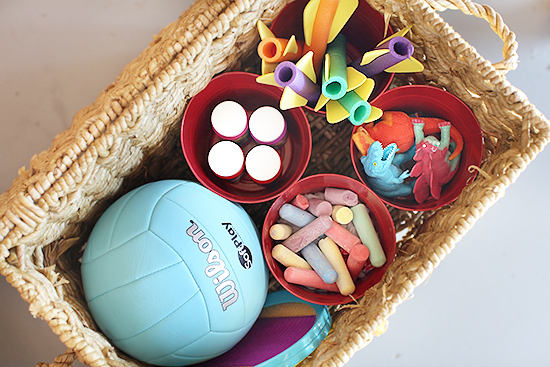 It is so thoughtful that you guys have a basket of goodies for when kiddos come to visit...what a fantastic idea!! So fun and adorable! I love the illuminated letter B. Super cute style. The wall art, rug, pillows, planters, furniture and curtains are all outdoor-friendly and can even easily be sprayed down or wiped off if needed (the curtains can even be thrown in the washing machine, which is a major plus). We've had quite a bit of rain (including a "mini monsoon" a few weeks ago and a huge storm last week) and haven't had any trouble with mildew. After there's a lot of rain, I close the curtains so they can be spread out and fully dry. Yeah, Virginia is notorious for pollen (it's awful, isn't it!?). Since the baskets are pretty far from the opening and mostly covered by the table, we're hoping they'll be okay. We finished this project near the end of pollen season and didn't have any trouble with it seeping in. If for some reason it happens, the non-rinsable things (like the burger papers) are covered with plastic. For mosquitoes, you might try some planters with either citronella plants, catnip, or eucalyptus. All three are considered to be natural mosquito repellents. And of course, avoid allowing standing pools of water from forming :). It's beautiful!! I love the plank ceiling and the curtains. It looks so relaxing and pretty. Awesome job!! I like how it turned out BUT one thing is missing in my opinion (I love green) is the lack of plants! I bet nice, big plants will make that place cozier and more vibrant. Awesome transformation! The space has a sort of an urban feel and yet looks so inviting. Very cool! Great job! I love how your organized this! It looks very cozy and neat! I LOVE what you've done with the room. What a perfect place to relax, and the table is so well styled. Beautiful! Thank you for sharing! This is beautiful. I despair of ever getting most parts of my house to go together as well as this does! Well done. I love the idea of having games for kids that visit, especially in the outdoor area (so that they don't mess up things inside, ha!). The transformation looks great, awesome job! I love this. I'm looking for an idea on how to store all the BBQ paraphernalia...the bbq brushes, gloves, rotisserie stick and all the gadgets for it. A Rubbermaid box looks so boring. that looks great! you just added so much more living space...agree though, def could use some more seating. Amazing transformation! What a great idea to utilize the space!! Thanks for sharing, this is so inspiring! Stunning! I love how it feels like an outdoor "room"! That art is gorgeous, and the organization is so well thought-out. Amazing job, Ashley! Wow! What an awesome space!